Kisha originally started from an archery training on horseback and afterwards it has been performed as a ritual. Yabusame, Kasagake and Inuoimono are well-known. Yabusame and Kasagake are currently held by Ogasawara-ryu. 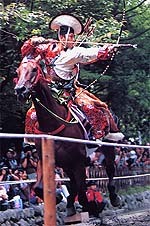 "Hosya" is a general term of the Japanese archery on the ground (not on horseback). In the Kamakura era, rules of main archery rites (the Ohmato-Shiki rite and the Kusajishi-shiki hunting performance) were completely regulated. Ohmato-Shiki, Kusajisi-shiki, Momote-shiki etc. are currently dedicated throughout Japan. Ogasawara-ryu "Reiho" is the manner of samurai, which is practical, simple and beautiful. However Reiho was established in the Muromachi period, its way of thinking and movement is adopted to the contemporary lifestyle. Reihou consists of how to stand, sit and bow as its foundation, and it also has the way of serving tea, and so on. 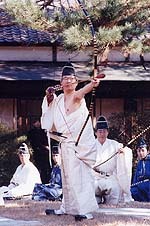 The rites of passage such as Kamioki-no-iwai, Hakamagi, Gempuku-shiki are currently held by Ogasawara-ryu.